Klaus Mühlhahn is a Professor of Chinese History and Culture and Vice President at the Free University of Berlin. His Criminal Justice in China: A History won the John K. Fairbank Prize in East Asian History from the American Historical Association. Mühlhahn has published widely on modern Chinese history in English, German, and Chinese and is a frequent commentator on China for the German media. Harvard University Press: It is tempting to attribute China’s recent ascendance to changes in political leadership and economic policy. Making China Modern teaches otherwise. 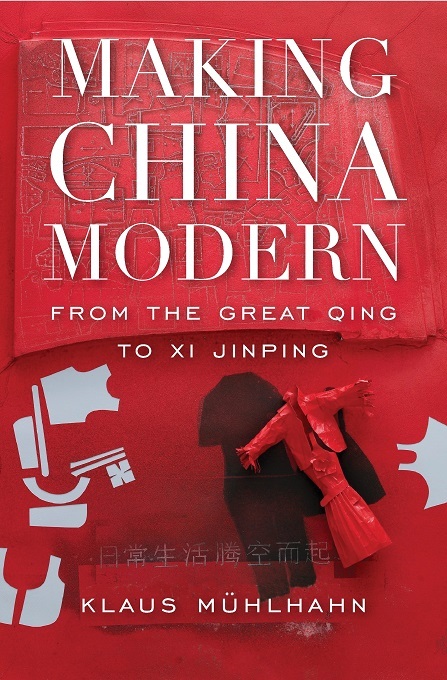 Moving beyond the standard framework of Cold War competition and national resurgence, Klaus Mühlhahn situates 21st-century China in the nation’s long history of creative adaptation. In the mid-18th century, when the Qing Empire reached the height of its power, China dominated a third of the world’s population and managed its largest economy. But as the Opium Wars threatened the nation’s sovereignty from without and the Taiping Rebellion ripped apart its social fabric from within, China found itself verging on free fall. A network of family relations, economic interdependence, institutional innovation, and structures of governance allowed citizens to regain their footing in a convulsing world. In China’s drive to reclaim regional centrality, its leaders looked outward as well as inward, at industrial developments and international markets offering new ways to thrive.